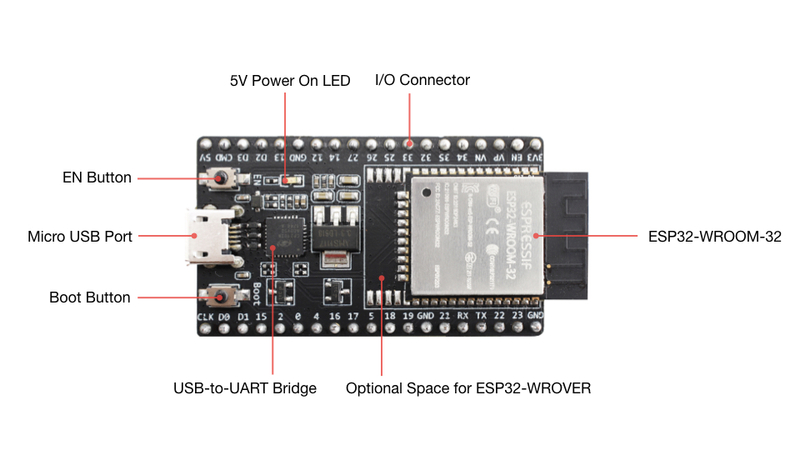 This guide shows how to start using the ESP32-DevKitC V4 development board. For description of other versions of ESP32-DevKitC check ESP32 Hardware Reference. You can skip the introduction sections and go directly to Section Start Application Development. ESP32-DevKitC V4 is a small-sized ESP32-based development board produced by Espressif. 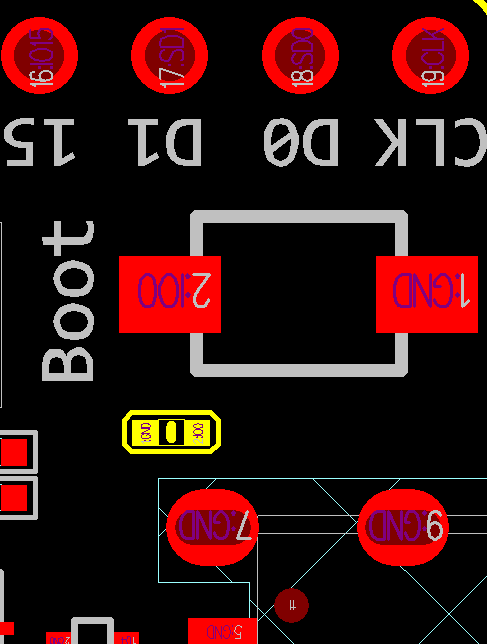 Most of the I/O pins are broken out to the pin headers on both sides for easy interfacing. Developers can either connect peripherals with jumper wires or mount ESP32-DevKitC V4 on a breadboard. male or female pin headers. For details please refer to Espressif Product Ordering Information. The following figure and the table below describe the key components, interfaces and controls of the ESP32-DevKitC V4 board. ESP32-WROOM-32 A module with ESP32 at its core. Boot Download button. Holding down Boot and then pressing EN initiates Firmware Download mode for downloading firmware through the serial port. 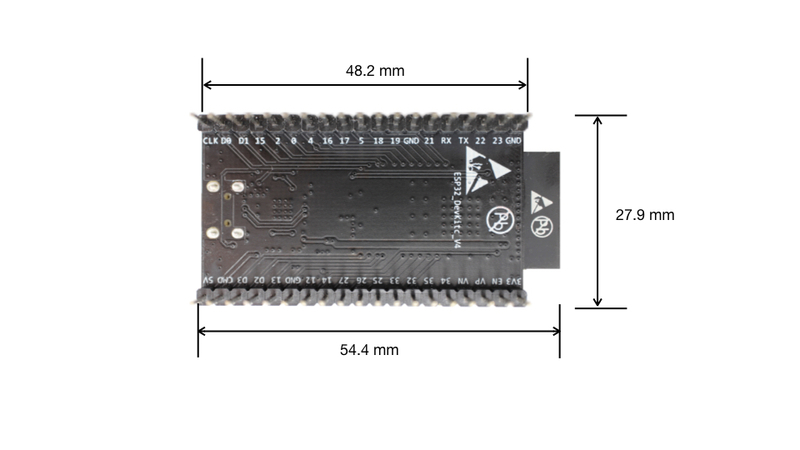 USB-to-UART Bridge Single USB-UART bridge chip provides transfer rates of up to 3 Mbps. Micro USB Port USB interface. Power supply for the board as well as the communication interface between a computer and the ESP32 module. 5V Power On LED Turns on when the USB or an external 5V power supply is connected to the board. For details see the schematics in Related Documents. I/O Most of the pins on the ESP module are broken out to the pin headers on the board. You can program ESP32 to enable multiple functions such as PWM, ADC, DAC, I2C, I2S, SPI, etc. The pins D0, D1, D2, D3, CMD and CLK are used internally for communication between ESP32 and SPI flash memory. They are grouped on both sides near the USB connector. Avoid using these pins, as it may disrupt access to the SPI flash memory / SPI RAM. The pins GPIO16 and GPIO17 are available for use only on the boards with the modules ESP32-WROOM and ESP32-SOLO-1. The boards with ESP32-WROVER modules have the pins reserved for internal use. The power supply must be provided using one and only one of the options above, otherwise the board and/or the power supply source can be damaged. In case these issues occur, please remove the component. The figure below shows C15 highlighted in yellow. Before powering up your ESP32-DevKitC V4, please make sure that the board is in good condition with no obvious signs of damage. After that, proceed to Get Started (CMake), where Section Installation Step by Step will quickly help you set up the development environment and then flash an example project onto your board.